If it weren’t for Commanders who were willing and able to take up the mantle of leadership, those hungry to liberate the galaxy from Imperial rule might never have come together to form the Rebellion. But command, whether it entails shaping military strategy, training new recruits, or being a recognizable face of the Rebel Alliance, is not easy. 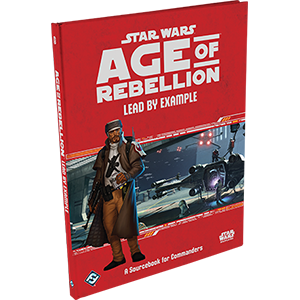 Lead by Example, a sourcebook for the Star Wars®: Age of Rebellion roleplaying game, offers Commanders the talents and other tools they need to succeed. Inside the 96 pages of this career supplement, players and Game Masters will find three new Command specializations – Figurehead, Instructor, and Strategist – as well as new playable species, gear designed to support Commanders in the field, and vehicles ready to take on Imperial fleets. The book also features detailed guidelines for situating PCs within large-scale, cinematic mass combat scenes and suggestions for crafting engaging, high-stakes, military campaigns.